FreshDirect | When I Dip, You Dip, We Dip! Set up some dips: salsa, spicy guacamole, queso dip. If you’re feeling adventurous, it doesn’t have to be from a jar; I’ve started making the fastest salsa known to man when I have the extra ingredients. I throw in a pint of tomatoes, half a sweet pepper, half a jalapeno (warning: because this recipe is blended, the seeds make it ultra spicy so keep milk on hand), juice from half a lime, salt, pepper, and “chop” in the blender. It’s still a little chunky, but mostly restaurant-style, which is how I like it. And while people are sometimes wary of making their guacamole, it couldn’t be easier: ripe avocado, tomato, onion, lime juice, chopped cilantro (if you like it), salt, pepper. Just mix! 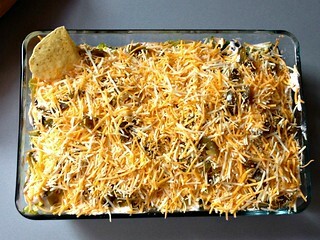 For another easy and fresh dip, grab a plate and layer: heated re-fried beans (with a packet of taco seasoning mixed in), shredded cheese, sour cream, sliced avocado (or guacamole), tomatoes, olives, jalapenos and fresh greens. How can that NOT be a crowd-pleaser? My co-worker Kim also recommended an even simpler dish that she enjoys with her hubby on game-day: a layer of cream cheese topped with canned chili and warmed through. Speaking of chili, my personal favorite way to celebrate football season is making a batch of spicy chili and serving with shredded cheese, sour cream, and chips for dipping. It’s really easy to feed large numbers this way. 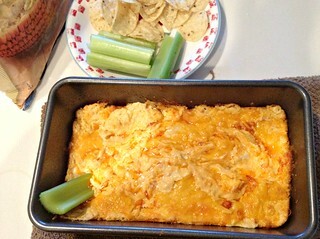 More classics include cheesy spinach-artichoke dip and buffalo chicken dip. They never look too pretty while you’re making them, but boy, are they sure to please. Let’s be honest, the secret to tasty, disappearing dips is cheese, cheese, and more cheese. For some lighter fare, put together a fresh veggie crudite platter: sliced cucumbers, blanched (and cooled) green beans, radishes, broccoli, and homemade dressing. You could also whip up some simply seasoned popcorn: add grated Parmesan and cayenne pepper. Of course, you don’t really need to do it yourself if that’s not your thing. Our catering department has everything from pigs in a blanket to lasagna to festive cupcake platters. Three cheers for that!